There it was in all its glory...the 1979 vintage style Snoopy snow cone maker. I became overwhelmed with emotion. I had no idea they were doing a re-make of this, nor did I know I would be holding back the tears as this unexpected memory popped out right in front of me. The icy sweet taste was almost again in my mouth and the sound of the shaved ice falling softly into the little paper cup was again almost filling my ears. I can't think of a place - maybe other than a museum - that has as much fun and creative inspiration as a toy store. While big box toy stores can be fun (or in our case emotional), what I like most of all are smaller, local toy stores. I like going there even if just to window shop and get creative ideas, and I think simple toys are often the most interesting. My daughter picked out this small music box and I decided to let her get it. 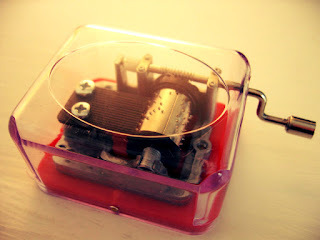 Normally music boxes are hidden inside something - but this one is cool because you can see exactly how it works. There are tiny metal pins - all different lengths for a different tone. The crank turns the cylinder which is encrypted with these tiny bits - like a punched card - to cause each of the pins to play the song. Of all the toys we play with as kids, the pop-culture toys undoubtedly reside in the archives of our memory. But the classic, timeless ones do, too. One symbol of Gen X's growing up years often gets forgotten...the flannel graph. Kids who went to Sunday school/vacation Bible school in the 70s have memories of watching their teacher tell stories on one of these. 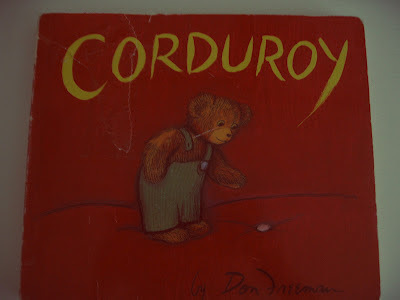 There would be a large upright board covered in flannel either in a solid color or with some sort of outdoor scene, and the characters, also made from flannel, could be placed on and moved around the board as the story is told. My slightly-younger-than-me Gen X husband speaks English as a second language (but also proofreads my blog entries because he paid more attention in grammar class than I did), remembers learning from a flannel graph in a public school ESL class in the early 80s. Flannel graphs were super popular during the time of Gen X's childhood. These days, now that there are all kinds of digital ways of teaching or telling a story, you might only see one occasionally. Hoping to pass on this important symbol to the younger generation, this week I made two flannel graphs -- one for my daughter and one for my Godson. The sun is high in the sky and a sailboat takes off across the water. Some birds head from dry land to the water. Here the clouds have drifted away, the sun is setting, and the sailboat to make its way back to the shore. The birds fly back to their nests as night comes. The story closes. I remember going to a church pre-school where the teacher would tell flannel graph stories. I immediately feel peaceful when I think of the way she would speak to us so gently and with so much kindness. The flannel pieces would attach to and come off the board so softly and easily as the story would go on. I loved watching Jesus and the apostles walking around on the flannel Holy Land landscape. It's nice when something simple can make you feel so content. I so distinctly remember being in the sanctuary with other little Gen Xers as we sat on the wooden pews, amazed at stories of miracles or captivated by the conversations of the people. I always wanted to have the kind of voice that teacher did - a voice that tells stories in such a way that those who listen feel peaceful and loved. Of all the voices we hear in our lives - those making demands, those criticizing us, those giving us unsolicited advice...I sometimes long to just sit, undistracted, in a sacred space and let someone tell me a story. This week started off cold and blustery which meant it was a good time to stay in and stay warm. We got ready for the upcoming St. Patrick's Day holiday by talking about St. Patrick and we made cookies in honor of his amazing life. We wanted to make three-leaf clover shaped cookies but that didn't quite work out so we just put green sprinkles on top to make them look clover-ish. Is it possible to make a gluten-free/sugar-free/vegan cookie that actually tastes good? The answer is yes. These turned out pretty decent - for being gluten-free/sugar-free and vegan, that is. Mix dry ingredients in one bowl and wet ingredients in the other, then stir all ingredients together. Form into balls and leave room on the sides. This amount should fill up two sheets. I baked the dough for 7 minutes, turned the sheet around and cooked it for 7 more minutes and then let the cookies sit on the sheet to cool and set for another 10 minutes. There were many situations in my life that meant I had to leave things behind. One of those was in college when I was renting a cheap space in a century-old building and the ceiling collapsed. There was a huge mess and almost nothing was salvageable. Being a poor college student, I could barely afford dinner, let alone renter's insurance, so I lost most of what I owned including many mementos from my life. It did make it easier to move though, since I could fit all my possessions in my car. Being a Gen Xer means having at least one, if not several stories like this - leaving things behind, traveling to a new destination and starting again. Many Gen Xers remember having to leave behind toys, books, or other mementos from their childhood that were close to their heart - often times before they were ready to. Gen Xers are a Nomadic Generation. * All that moving around has required that you leave things behind. While leaving your toys behind in some cardboard box meant you would never see them again in your younger years, all you have to do these days is go online, find it, and have it shipped to your doorstep. I hold things loosely, and I realize it isn't so much about that remnant from my past as it is about the feeling I get from being around it. Having to constantly let go of things teaches you, even if just for practical reasons, to be unattached to material things, but sometimes it's nice to get something back. looking for his missing button in the story just as many of us go looking for the missing pieces of our lives. I'm a person who is big on the concept of redemption. If you want to bring back something into your life that you had to leave behind, one thing that can be redeeming is to buy it used. Other than saving money, I like feeling like I can own something that someone else in my generation once owned, that I was not alone in what I experienced when it was part of my life, and that so many others were going through the exact same thing at the exact same time. Time closes behind us with every passing minute, we cannot relive the exact same moments that we once had - in fact, many things we would never want to relive. While it seemed like parts of your childhood had to be left behind, there is a way to get it back. It can be about making homemade play dough to inhale the smell and bring back a flood of memories, it can be about eating that comfort food that warmed you up when the weather was cold. It can be about buying something you once enjoyed that is second-hand and enjoying it even more because someone else in your same generation owned it once too. That is what the Fireflies at Dusk project is about...to get the good parts back of my Gen X childhood so that I can help others do the same. We were, and are, all in this together. *William Stauss and Neil Howe, the creators of Generational Theory, have identified generational archetypes that have cycled through history, and have written about how Generation X falls into the Nomadic personality type. Part of this personality type includes a sort of unsettled, roaming existence. Rare Gen Xers who lived in the same place through their growing-up years experienced this at least existentially, and most Gen Xers experienced this in the constant change of their geographic location as well.